Ginger benefits go beyond that fresh zingy taste that brightens you up. Considered a superior medicine in China and India, it is receiving US medical attention too. Ginger (in the same plant family as Turmeric) comes from the underground stem of the plant Zingiber officinale. The designation officinale indicates its official status from long time use in Eastern medicine. It’s used as a tonic that when taken regularly over time, gradually tones and strengthens the body’s natural healing system. More recently, studies conducted in Europe and Japan document many of ginger’s therapeutic benefits. Imbalances in eiconsanoid synthesis and release underlie many common illnesses, from arthritis to peptic ulcer to increased platelet aggregation that can trigger heart attacks and strokes. Weil also reports that like garlic, ginger has anti-cancer effects, blocking the ability of some carcinogens to cause mutations in DNA. 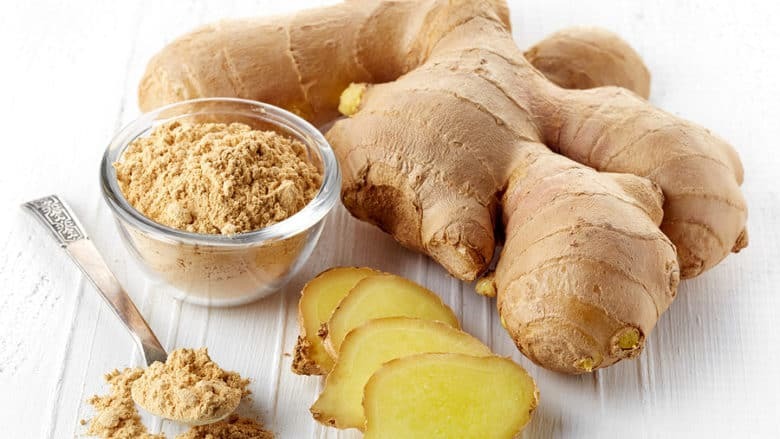 Relieves Aches and Pains – high in proteolytic enzymes, ginger contains at least four natural COX-2 inhibitors and unlike prescription COX-2 inhibitors like celecoxib (Celebrex) it’s not associated with serious side effects. Anti-inflammatory – contains high amount of zingibain, a powerful anti-inflammatory substance. It may be as effective as anti-inflammatory drugs, but much less toxic as it protects the stomach lining instead of damaging it. Circulatory System – thought to tone the circulatory system and reduce clotting. Helps Colds and Flues– Sesquiterpens, chemicals within ginger, specifically work against the rhinovirus, the most common family of cold viruses, It also helps suppress coughing and reduce fever and pain, reports James A. Duke in The Green Pharmacy Guide to Healing Foods. Crystallized Ginger Slices – a tasty want to get ginger and satisfy your sweet tooth too. Herbal Tea – Steep three to four slices or ½ teaspoon grated fresh gingerroot in a cup of boiling water for 10 to 15 minutes. Then strain and add honey to taste. Explore drinking green tea too. Food Recipes – Add grated ginger to recipes like tuna salad, or as a marinade and seasoning with meats and other foods. You can also sprinkle powdered ginger into foods as well. Dietary Supplements – If you want faster effects, you can get ginger in medicinal doses through tinctures and capsules. You can also use it in combination with other natural pain relief herbs—turmeric, oregano, rosemary, green tea, and holy basil—in products like Zyflamend. Ginger benefits make it a superior medicine and it’s a tasty healthy food too. Like ginseng and milk thistle herb, it acts as a tonic when taken regularly over time. Ginger gradually tones and strengthens your body’s natural healing system while it energizes and spiritually uplifts. Duke, James A., The Green Pharmacy Guide to Healing Foods: Proven Natural Remedies to Treat and Prevent More Than 80 Common Health Concerns(Rodalestore.com: Rodale, 2008). National Center for Complementary and Alternative Medicine, “Herbs at a Glance: Ginger,” at http://nccam.nih.gov/health/ginger. Reid, Daniel, The Complete Book of Chinese Health & Healing (Boston: Shambhala, 1995). Weil, Andrew, 8 Weeks to Optimal Health (New York: Ballantine Books, 2007).